Bond heads back to the States with a new mission and a new face! The Mission: With three agents murdered in the space of a day while investigating the dictator of a small Caribbean nation called Dr. Kananga, Bond is dispatched to New York to find answers and the link between Kananga and a local drug dealer called Mr. Big. Locales: Harlem, New York, the fictional San Monique in the Caribbean, Jamica and New Orleans, Louisiana. 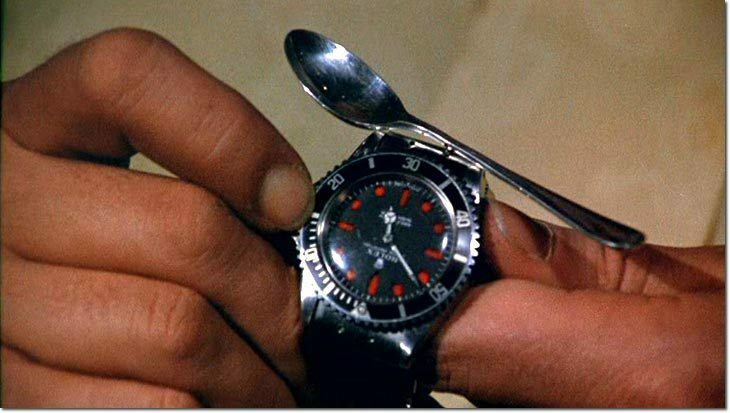 Gadgets: A magnetic watch is Bond’s item of choice on this outing. He has a device for detecting surveillance equipment and takes advantage of a rigged tarot deck for seduction purposes (and who hasn’t done that?). An anti-shark gun provided by Q plays a large role with the final confrontation with Mr. Big. Vehicle: Bond tends to get chauffeured around a lot in both and boats on this mission, but he does mix things up with a hang-glider with infiltrating Mr. Big’s compound. Sidekicks: Felix Leiter makes another appearance, providing CIA support. When he needs transport he recruits Quarrel Jr., the son of his ally in Dr. No. The Girls: Solitaire (Jane Seymour) is a gifted tarot card reader who gives Mr. Big a competitive edge in his business until she is seduced away by Bond. Rosie Carver (Gloria Hendry) is a CIA agent assigned to San Monique. Miss Caruso also briefly falls in with Bond following a previous mission. The Enemy: Dr. Kananga and Mr. Big – who are in actuality the same person. Evil Plot: Using the combination of his two identities Mr. Big intends to float the Harlem market with free heroin with the intention of driving other dealers out of business. Distinguishing Features: Apart from using latex to change his appearance, Mr. Big does not have any distinguishing features. Secret Lair: When in the USA Mr. Big owns a franchise of ‘Fillet of Soul’ music halls, tricked out with secret entrances and meeting rooms. Henchmen: Quite a number here. Whisper tends to work undercover and, um, whispers. Tee Hee is more menacing and has a mechanical right arm capable of crushing a gun. Baron Samedi is not as directly linked with the organisation and somehow manages to cheat death. Adam gives chase to Bond through the Bayou. Rosie Carver is also revealed to work for Mr. Big and rely information about Bond. Politically Incorrect Behaviour: Waiting until sleeping with Rosie Carver before revealing that he knows about her betrayal. When she questions him about it he responds by telling her that he would hardly tell her first. 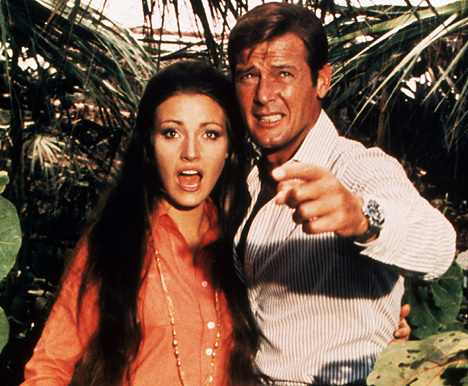 Notable Firsts: Obviously, this is the first adventure with Roger Moore! It also marks the first appearance of Sheriff J.W. Pepper whose slack jawed comedy relief would turn up again in the next film. Random Trivia: United Artists had a strange notion that an American should play Bond, suggesting Reynolds, Redford and Newman for the part before offering it to Clint Eastwood. Eastwood obvious had more sense than the UA and turned it down, stating that an Englishman should have the role. 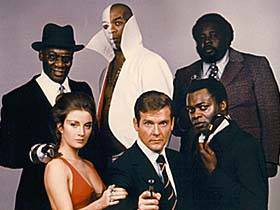 When the movie was aired on American television almost all scenes feature Baron Samedi were cut. When shooting the Bayou boat chase the stunt team broke a World Record by launching the speedboat through the air a total of 120 feet. Demonstrating his usual ability to write best-selling songs at short notice, Paul McCartney wrote the them along with his wife Linda the same afternoon that they read the book. The track went on the be the first Academy Award winning Bond theme. Nice collection of tidbits about the movie here! FYI I think you have a typo in the last line of Henchmen. Should it be “relay” information?